Mr. Northfield Entertainment Guide and By All Means Graphics owner Rob Schanilec is famous here in Northfield. Rob has a brother named Gaylord Schanilec (Midnight Paper Sales) who’s equally famous in the town of Stockholm, Wisconsin and to some extent, the rest of the Western Hemisphere. Gaylord’s work as a wood-engraver was profiled last week in a StarTribune article titled A bookmaker, unbound. "He’s one of the two or three finest color wood-engravers ever. He’s really that good," said Robert Rulon-Miller, a rare book dealer in St. Paul who has followed Schanilec’s career for more than 30 years. "He’s a man of many parts: engraver, printer, bookbinder, editor, writer, natural philosopher, and he brings all this stuff together into his books." 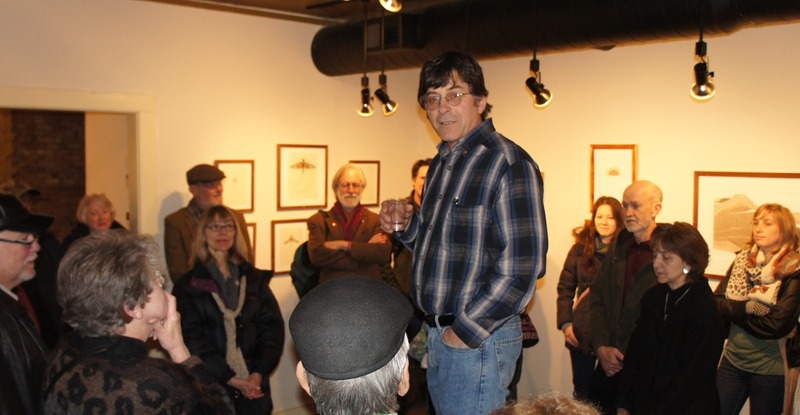 Robbie and I went to see his work and hear him speak on Saturday at the Groveland Gallery. That exhibition is profiled here on the MN Monthly site.